Cult game designer Suda51 has always made games that divide opinion. 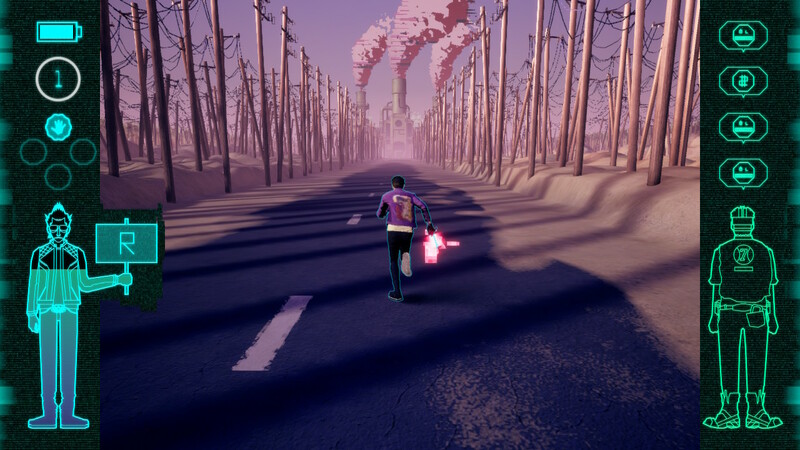 Whether it’s the heavily stylised Killer7, the sexually provocative Lollipop Chainsaw, the punk rock demon hunting of Shadows Of The Damned or the combo-based bloodfest that is Killer Is Dead, gamers have always been split into two camps: those who believe his games have always felt a little rough around the edges, and those who say his often eccentric and bizarre storylines make up for it. On Nintendo systems, Suda’s best known for the two No More Heroes games, which very much embodied this division. The story of nerdy otaku Travis Touchdown and his quest to kill everyone on a global assassin leaderboard was criticised by some for its slightly clunky combat and repetitive action, but praised by others for its outlandish plot, lashings of gore (in some regions) and tendency to shatter the fourth wall into tiny polygonal pieces. It’s been eight years since No More Heroes 2, and those who fall into the second camp (including me) have been desperately praying for a third game in the series. 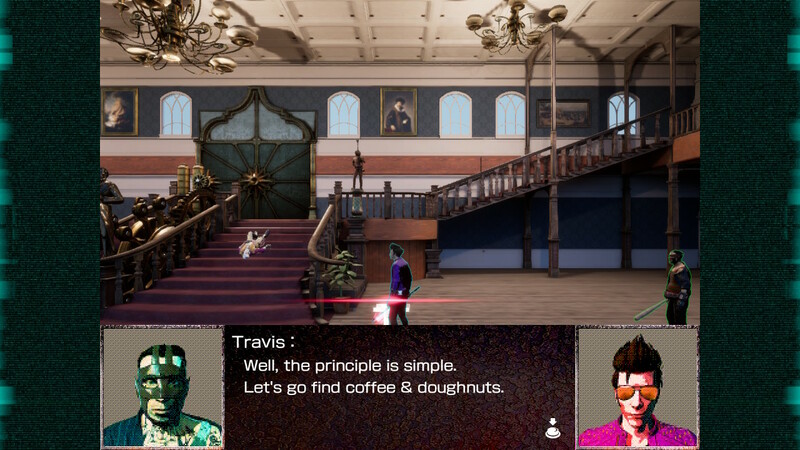 Travis Strikes Again isn’t it, but it’s a fun spin-off that should satisfy their cravings for a while. In the years that have passed since the events of the second game, Travis Touchdown has decided he no longer wants to be part of the UAA assassin league table. Becoming a recluse, he shacks up in a camper van in the middle of nowhere and spends his days playing video games. All this changes when Bad Man – the father of Bad Girl, who Travis killed in the first No More Heroes – finally tracks down his daughter’s assassin and attempts to get revenge. During the scrap, Travis’s mysterious Death Drive Mk II – a cancelled video game console with magical powers – boots up and swallows both of them, transporting them into a video game world. Legend has it that whoever manages to collect and complete all six Death Drive games will have any wish granted, so while Travis attempts to fight his way through each of the game worlds, Bad Man decides he’s going to try to beat him to it, in the hope that the Death Drive will grant his wish to bring his daughter back to life. 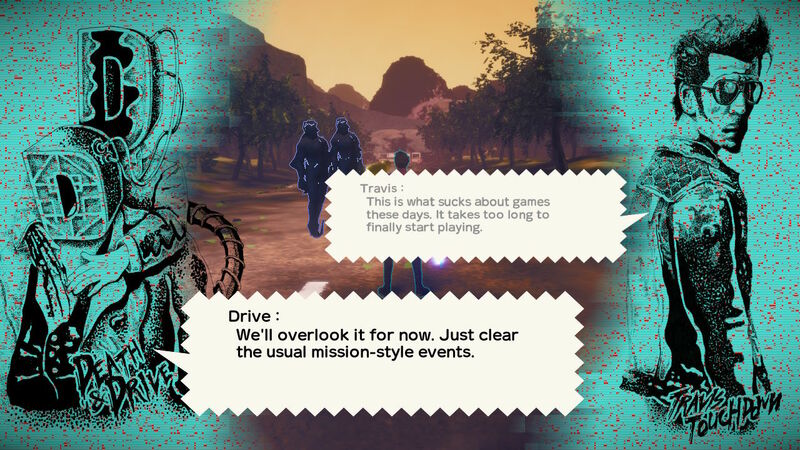 Despite what was reported by various sites after it was first announced, Travis Strikes again doesn’t actually consist of six completely different game styles. 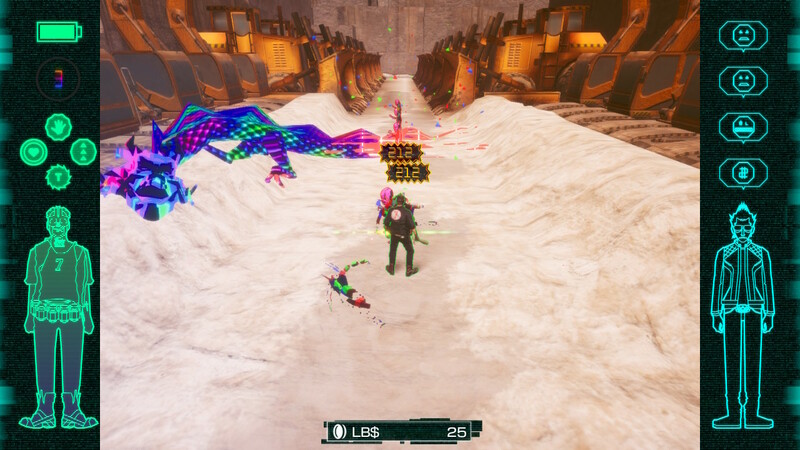 While Travis does indeed jump between six different games – well, actually more than that, but that would be spoiling things – each of these features the same hack-and-slash style of combat, with Travis (or Bad Man) able to level up and acquire new skills throughout the course of the game. The combat is fairly straightforward. You’ve got a quick attack button, which you can hold down to constantly swing your beam katana (or your baseball bat, if you’d rather play as Bad Man), a strong attack button – which stops you in your tracks and takes time to recover from – and a dodge move. Along the way you’ll gather special skill chips: you can assign up to four of these and gain new powers from them, like the ability to stun enemies, create a decoy or spawn a temporary area that restores your health while you stand in it. And that’s it, really: levelling up simply increases your attack power and maximum health, there are no new attack combos to learn or anything like that. 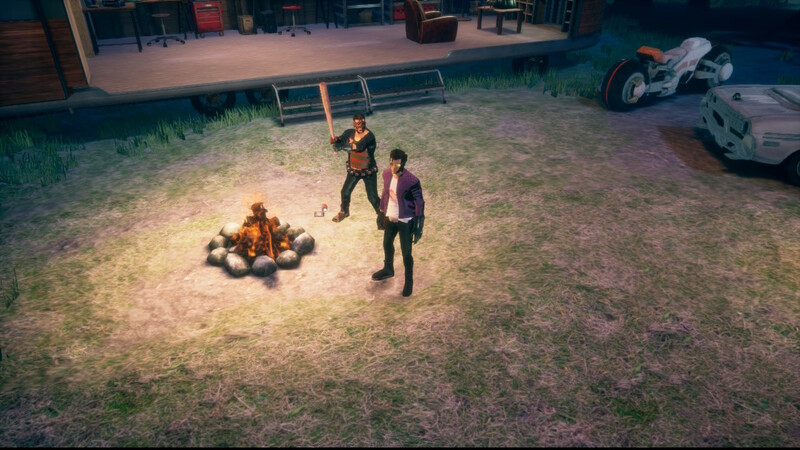 In true No More Heroes style, you also have to charge your beam katana every now and then, or it’ll run out of power (or, if you’re playing as Bad Man, you have to regularly drink beer so you can stay drunk and dangerous). This can be done in the traditional style by standing still, holding a button and waggling the JoyCon / Pro Controller, but if you’d rather not use motion (or you’re using a third-party controller that doesn’t support it) you can waggle the right stick instead. So, be under no illusion: this is a hack and slash game, not a collection of mini-games. What each stage does, then, is wrap this combat around a different theme, adding various gimmicks in an attempt to prevent things from feeling too repetitive. One stage, for example, has an almost Resident Evil vibe as you explore the various rooms in a mansion, completing the mini-stages found inside each in search of coffee and doughnuts to feed to dying medieval soldiers so their souls can be freed. Look, don’t ask. Another has you fighting your way through the floors of a tower to find upgrades for a race car, which you can then use to take part in a series of drag race challenges (these are one of the few sections where the gameplay does actually deviate from pure combat). Meanwhile, one stage has you tracking down a serial killer by visiting the homes of people he’s killed, but before you can reach each home you have to solve switch-based puzzles to rotate pieces of the street map, all while a giant blue head (which can kill you with one hit) chases after you. You may be thinking: “Hmmmm. A lot of this sounds mental. I’m sure when I play it things will make more sense.” That’s not really the case, but don’t worry: that’s completely fine. We’re talking about the No More Heroes series here, a franchise well known for its completely random moments. When you consider that the last game had you summoning a giant mech called Glastonbury for the sake of a one-off fight, having unexpected things chucked at you is part of the territory. This is all supported with the typical fourth wall breaking people have come to expect from Suda51. There are constant references to the game’s development (one cut-scene is cut short to save on localisation costs), the Unreal Engine is regularly heralded as a saviour (with numerous Unreal Engine t-shirts to unlock) and lengthy dialogue is criticised by the characters, who openly protest that nobody bought this game to read lots of text. It could be argued that it often suffers from a failure to practice what it preaches: occasionally it’ll mock an overused gaming trope then proceed to do it anyway. The regular appearance of a sheep-based sub-boss initially makes you laugh as it declares that it’s allowed to come back as long as it’s stronger each time, but when it actually does return in every stage you start to wonder whether the game is actually being clever, or just trying to address the elephant (or sheep) in the room before anyone else can call it out. 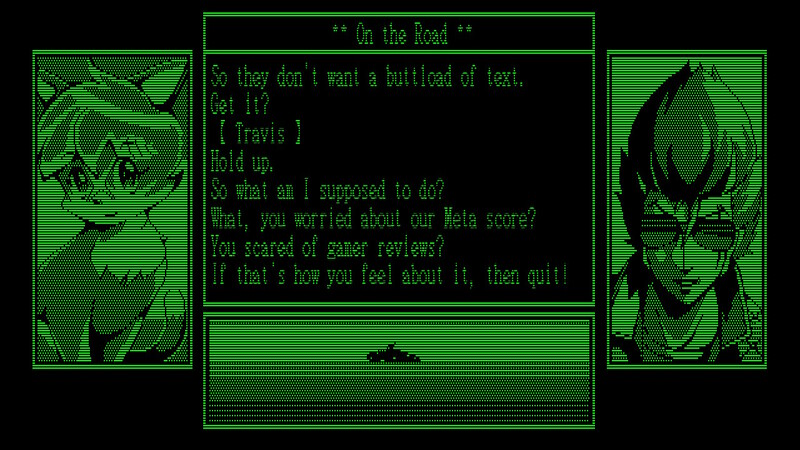 Meanwhile, the aforementioned claims that nobody bought the game to read are soundly ignored with the presence of Travis Strikes Back, a visual novel presented as an Apple II / TRS-80 style adventure with green pixelated graphics and chiptune music. Although I personally found this bit thoroughly entertaining, folks who aren’t interested in visual novels may not be so keen, and the fact that you need to read your way through one of these sections after each stage – they explain how Travis finds each new Death Ball – means some may consider them an unnecessary intrusion in what’s supposed to be an action game. You know, like the characters keep telling us it is. 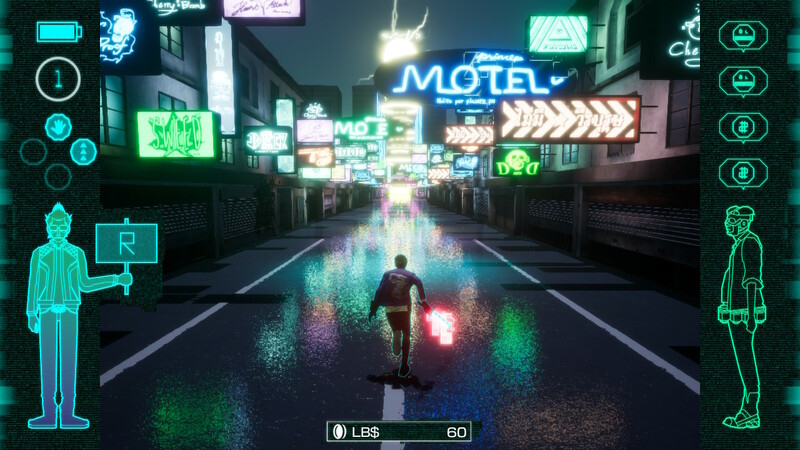 Travis Strikes Again is a natural extension of the No More Heroes series, and while it replaces its typical third-person action with more arcade style, usually top-down gameplay, it still carries over many of the same strengths and weaknesses fans of the franchise have come to expect. It still lives or dies by its eccentricity. 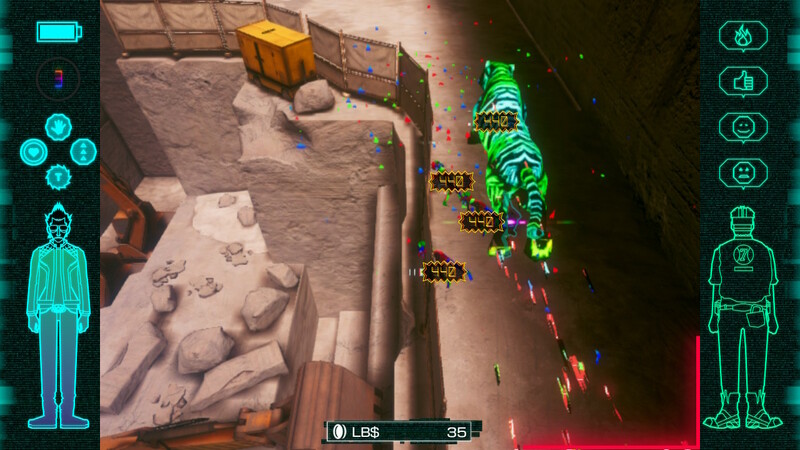 Even though each of its ‘games’ tends to last around an hour on average so as not to outstay its welcome, you’re still fighting similar enemies in each and so the overall 8-10 hour experience can feel like a bit of a grind. The final level in particular – which (without spoiling anything) is notably free of interesting background detail – can be a real test of your patience. But this is all entirely forgivable if you buy into the game’s ridiculousness: its wilful tossing around of shocking language, the bizarre cut-scenes introducing each game, even the offbeat subplot in which you receive a steady stream of faxes from one of the Death Drive’s co-creators who tries to explain to you what you’re really dealing with. It’s the stuff that has nothing to do with the main game that really give it character too. Going off in tangents is Suda51’s forte, and when he’s at his best he doesn’t so much subtly nod and wink as go entirely all in. Each time you unlock a new Death Drive game, you also unlock a ‘90s style magazine article previewing the game, complete with loads of bad jokes and tips. Each level has a ramen shack or two that restores your health: when you visit it you unlock a new article on Travis’s food blog where he reviews each ramen dish in detail. And don’t forget the much-publicised t-shirt collection, where you can unlock a frankly ridiculous number of t-shirts based on other indie games. In a recent interview with yer man Scullion, Suda51 confirmed that there are more t-shirts to come in future DLC and that some of them may surprise us: the two you unlock for beating the game certainly give credibility to that statement. Best of all, the game’s fifth stage… well, that would be telling. Be wary, because a lot of sites will be reporting this in their news sections or giving it away in reviews: if you’re familiar with Suda51’s past work you may want to try to reach this section without having it spoiled for you first. But there’s a reveal here that will drop the jaws of fans of his output (and Grasshopper’s games in general), concluding with an exciting little revelation. It’s hard to nail down whether you should be playing this game, because it really depends on your tolerance for style over substance. The actual game itself is a fairly mindless hack and slash affair with little in the way of character upgrades or progression (a basic levelling system and collectable abilities aside), and while it’s perfectly entertaining to play it isn’t going to win any awards on that front. But in terms of its plot, its knowing humour, its countless references and its downright insanity, I’m confident in saying that you won’t play another game like this on the Switch. I absolutely loved it as a result of this and consider it one of the most entertaining games I’ve played in a while: if you’re more interested in depth than daftness, though, your mileage may vary. 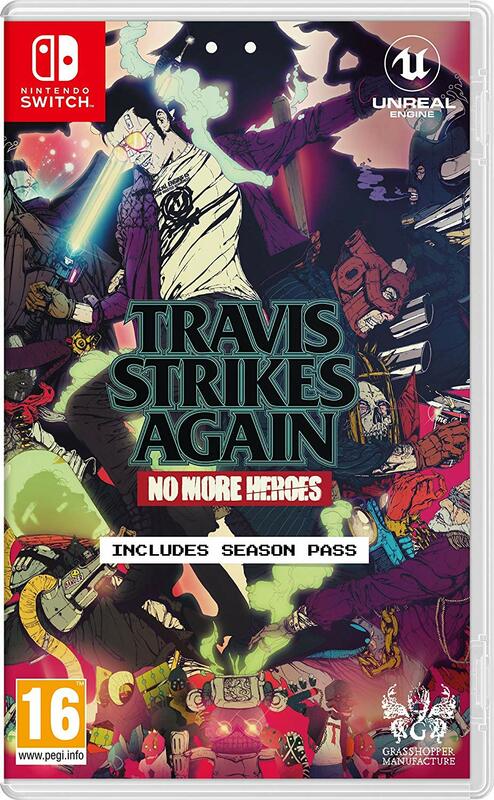 Travis Strikes Again: No More Heroes is out on Nintendo Switch on 18 January. You can buy the digital version from Amazon UK and Amazon US. Alternatively, you can buy the physical version (which includes a Season Pass for future DLC) from Amazon UK and Amazon US. In order that I could write this review, I received a digital copy of the game from a PR. The content of my review and the opinions therein were in no way positively influenced by this. Hey, Yer Man Scullion! I just appreciate your reviews without a score system. It makes me read the entire text and have a much better information about the games. Well, I love the NMH series. It has been a long time since they released the last entry. Hack and slash games are usually a relaxing experience for me. I am curious about the plot and the forth wall breaking thing of this one. This seems to be a nice title to be playing soon, specially if you consider the asking price right after the Christmas season. Quick Q: is there anything to keep you coming back after you beat the game, say a NG+ or to unlock more Tshirts? This looks like the sort of game I might actually have time to play! You unlock an extra difficulty level, and there’s DLC on the way. Cool, thanks for that. Couldn’t find anything online about it.